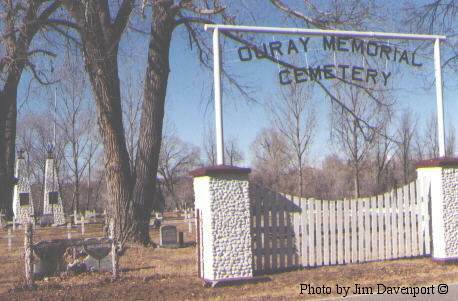 Ouray Memorial Cemetery is the cemetery for the Southern Ute Indian Tribe at Ignacio, CO, LaPlata county. 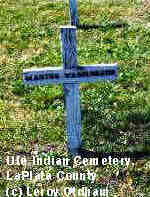 It is located on the Southern Ute Indian Reservation, Ignacio, CO. To get to the cemetery go east out of Ignacio on Colorado Highway 151 for about a half mile then turn north on County Road 521 for about a mile or so and you will see the cemetery on the west side of the road a short distance off of 521. There is a frontage to the cemetery. 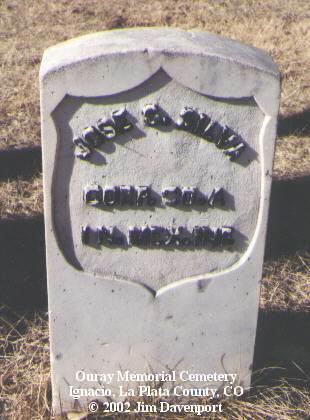 Buckskin Charlie was a famous Ute Chief who played a part in the county history. 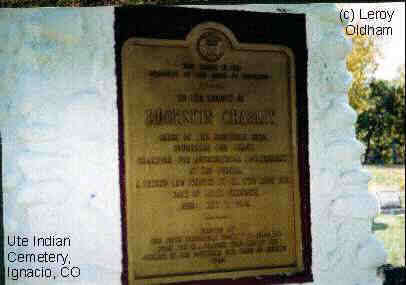 Buckskin Charlie, "This tablet is the property of the State of Colorado; To the Memory of; Buckskin Charlie; Chief of the Southern Utes; Counselor for Peace; Champion for Agricultural Advancement; of his People; A Friend and Beloved by all who knew him. Date of Birth Unknown, Died May 8 1936 Erected by The State Historical Society of Colorado; From the C. A. __?__ fund and the Council of the Southern Ute Tribe of Indians 1983"
Washington, Martha, (no dates); Martha Washington once lived at a well known land mark now known as Washington Flats.